Men returning from war service found that while styles hadn’t changed much, their bodies had. The image of an ex-GI trying on his old civilian clothes and finding the sleeves miles too short was generally played for laughs. “Nothing fits except the camels” A returning soldier dressed for a golf game in his old sports civvies, 1945. But men who needed a new suit PDQ to apply for a job or a GI loan might find it wasn’t so easy. 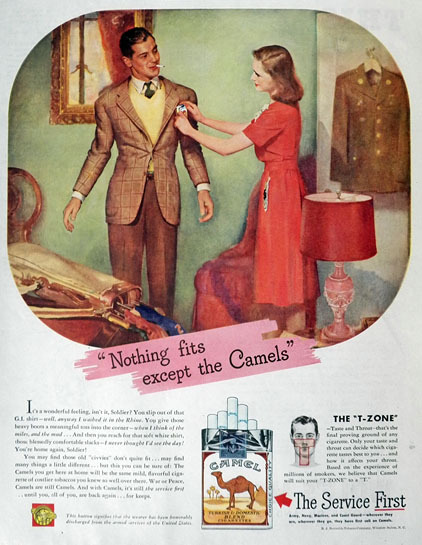 Sure, if you were Major Clark Gable, Brooks Brothers or other high-end haberdashers could kit you out, no problem. Casual sports attire wasn’t hard to come by, either. But affordable dress shirts and suiting material was in short supply. 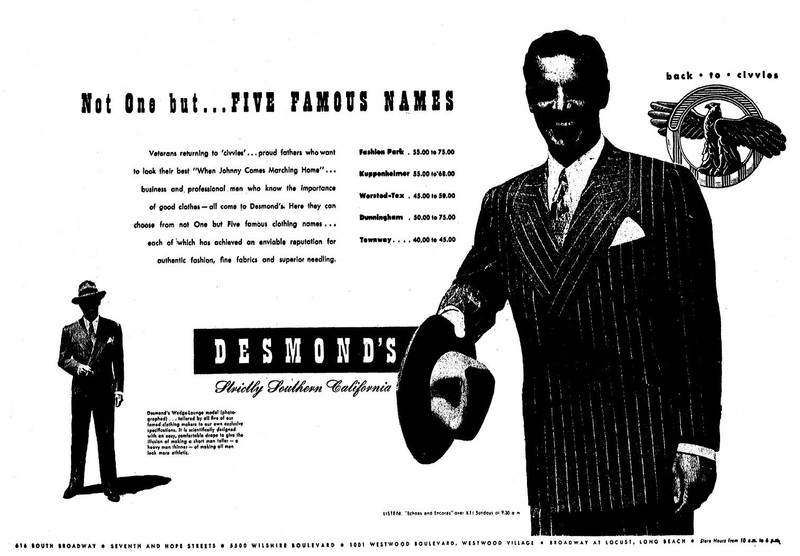 The Civilian Production Administration (which replaced the wartime War Production Administration in October 1945) estimated that 1946 would see a shortage of some 15,000,000 men’s suits, that it would be a year before there were enough shirts to meet the demand, and perhaps a year and a half before suits became “plentiful.” A recent military order that men still serving in the armed forces could wear civilian clothing while off duty added to the demand. 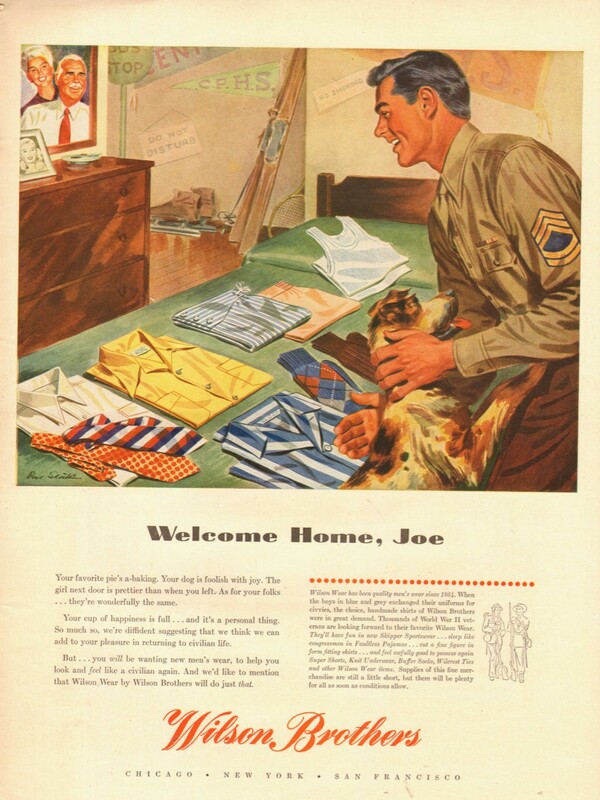 “Welcome home!” A lucky returning technical sergeant finds his proud Mom and Pop have laid out an entire new wardrobe for him in his old bedroom. 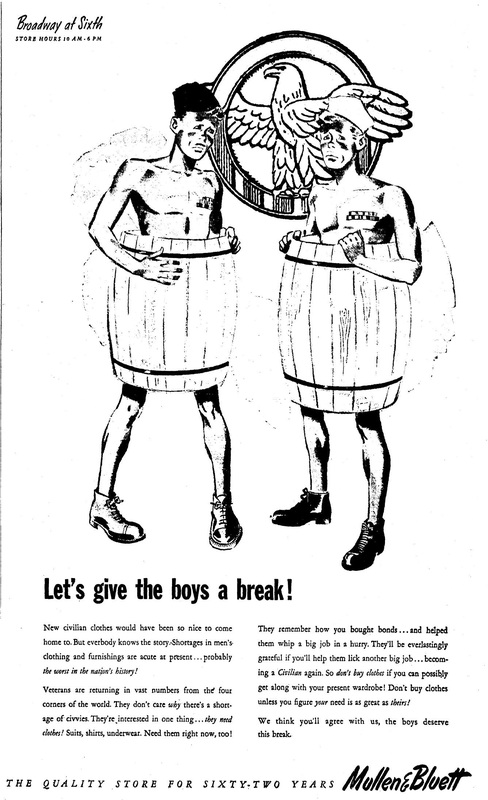 Wilson Brothers, 1945. 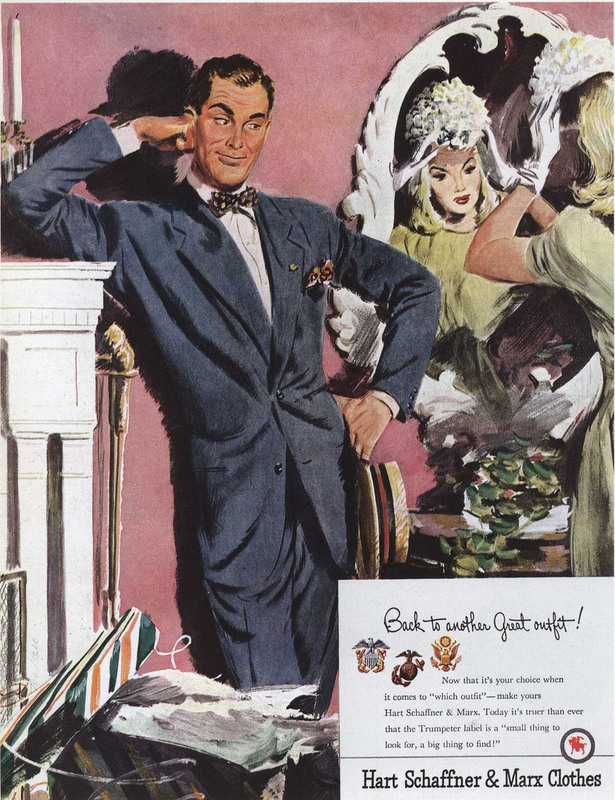 “Now that it’s your choice when it comes to ‘which outfit’…” National brand Hart, Schaffer & Marx Clothing ad aimed at ex-servicemen, 1946. 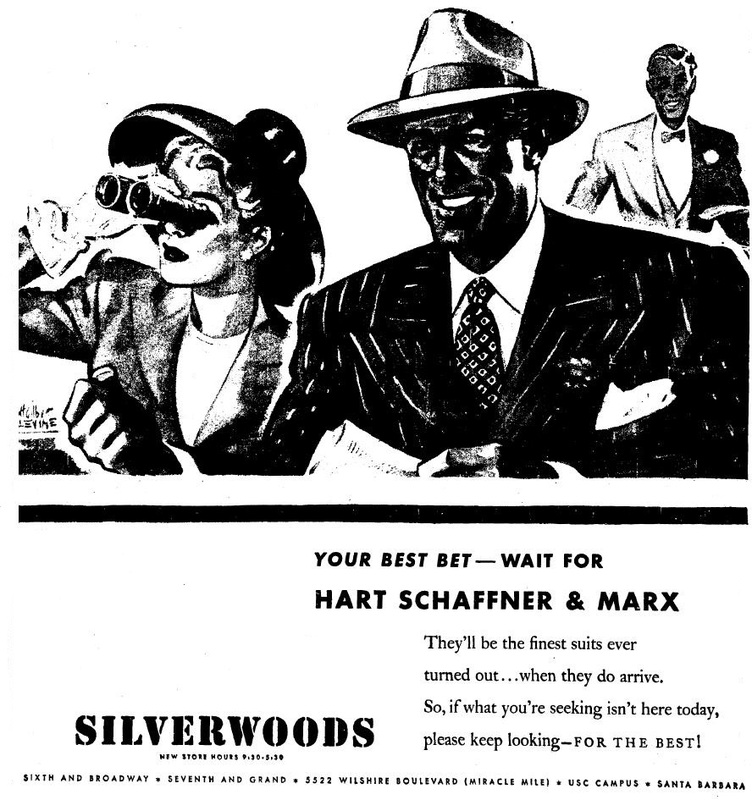 “When they do arrive…” Silverwood’s, local retailers for Hart, Schaffer & Marx, didn’t have any to sell in January 1946 but advised customers to keep checking back. The store would sell out of the suits as fast as they were stocked. 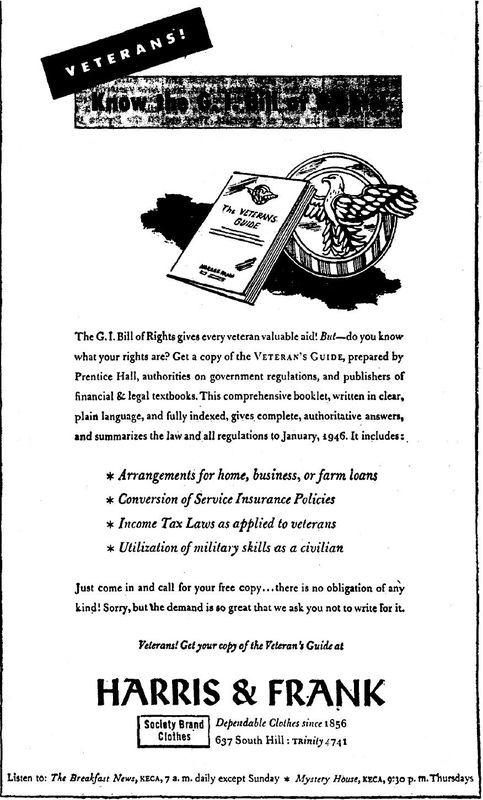 Bargain retailers Harris & Frank in April 1946 were offering free copies of the GI Bill Veteran’s Guide to customers, most of whom were likely to be vets in need of new civvies. 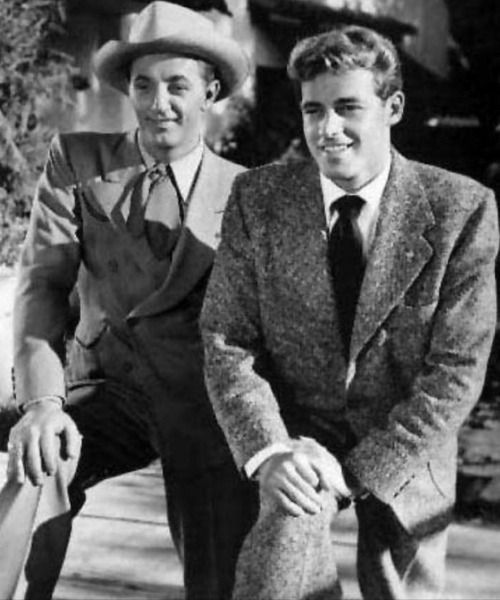 Robert Mitchum and Guy Madison as returning veterans in Til The End of Time (1946) show off their postwar duds- Mitchum in a Western-styled double-breasted suit, Madison in tweeds. Male stars typically wore their own clothes in films, if the setting was contemporary. 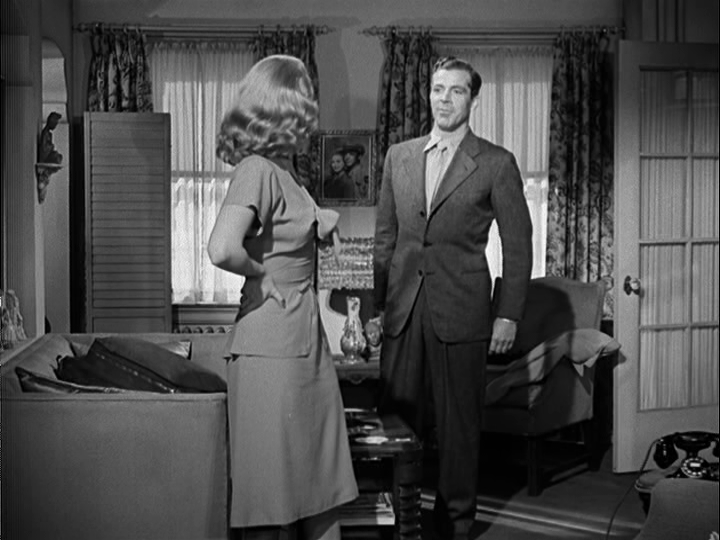 Dana Andrews’ war wife is underwhelmed seeing him in civvies for the first time in The Best Years of Our Lives (1946). Nothing said ‘Hallelujah, I’m a civilian again!’ like a new necktie- the wilder the better. 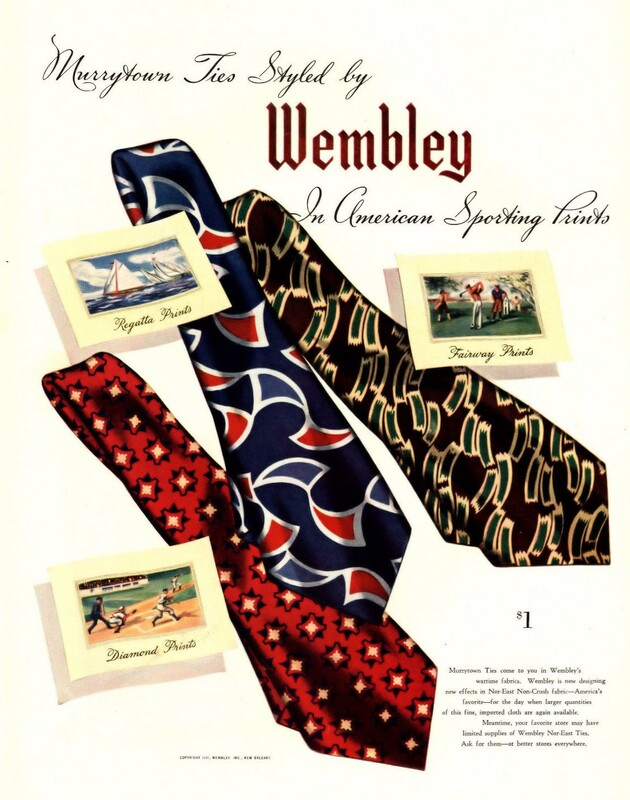 “Bold” patterns were particularly popular in California, necktie manufacturer organizations reported. 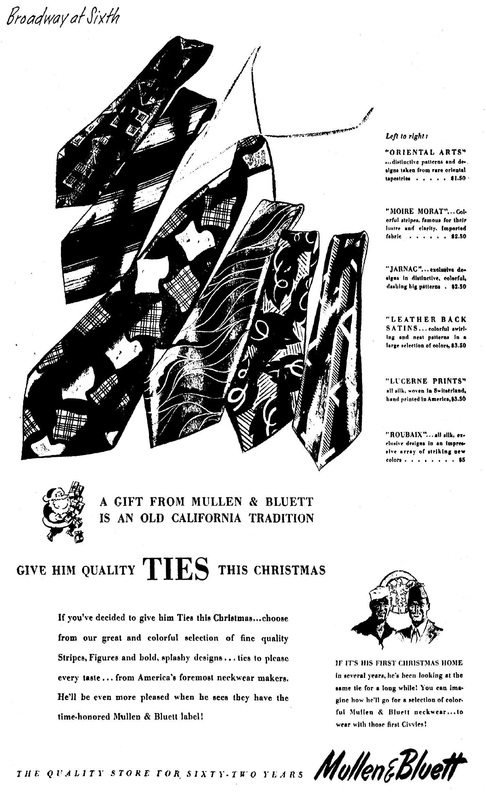 “If it’s his first Christmas home in several years, he’s been looking at the same tie for a long while!” Many returned veterans likely found a new necktie under the tree for Christmas 1945, like these from Mullen & Bluett. One of a kind d’Arsac designed ties, like this playing cards number, cost $10. $15, $25 & up. They retailed locally at Rodeo & Wilshire, Beverly Hills. 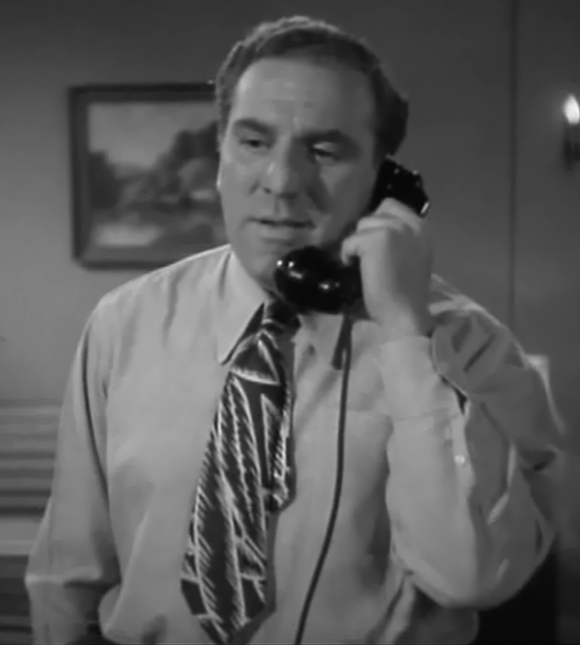 Returning war veteran Buzz (William Bendix) in The Blue Dahlia is bothered by loud jukeboxes but has no problem with noisy neckwear. 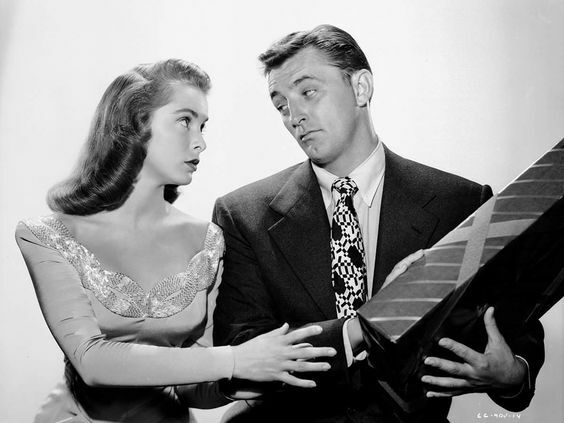 In Holiday Affair (1949) war widow Janet Leigh, who always gave her late husband a wild tie for Christmas, regifts one to Robert Mitchum. After the war men, young men particularly, were less inclined to don hats. 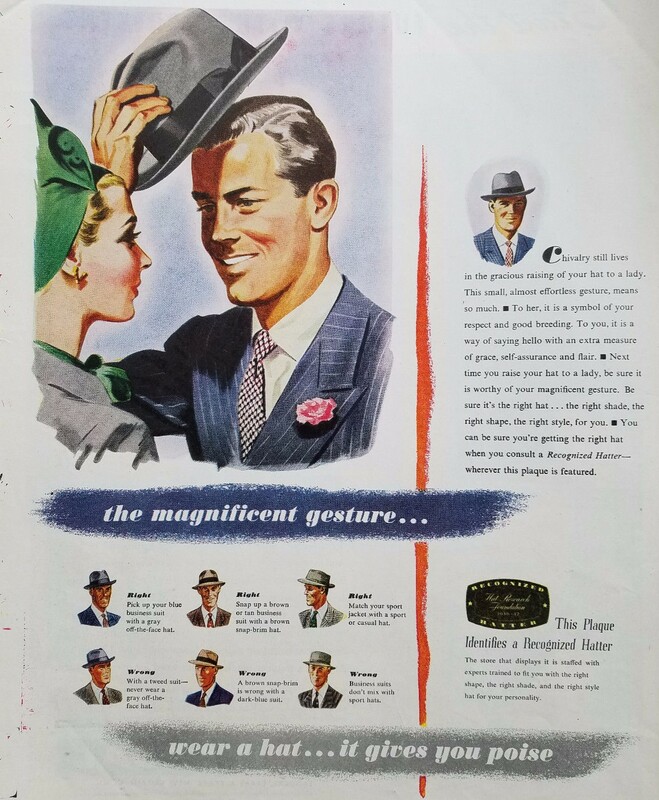 The Recognized Hatter organization ran an ad campaign to counter the trend. 1945. 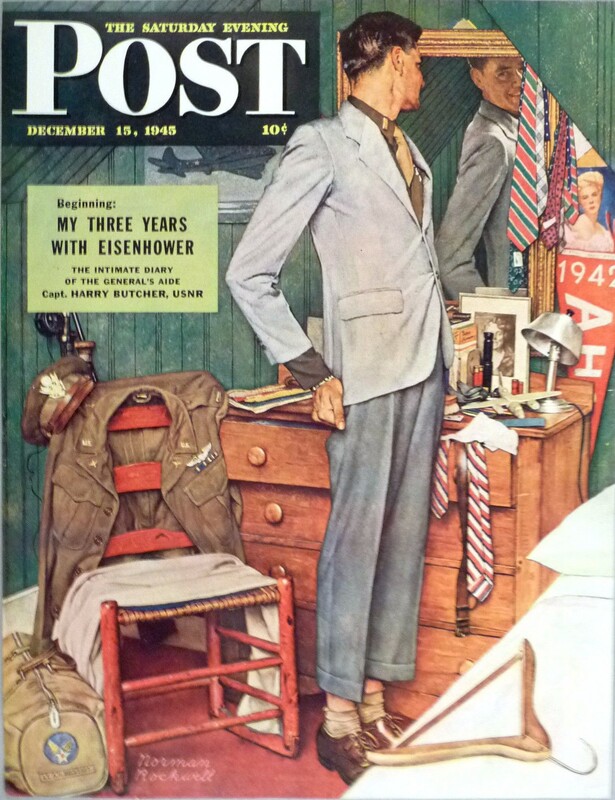 Top image: Norman Rockwell cover “Imperfect Fit” for Saturday Evening Post, December 15, 1945.